Have you ever seen anyone looking more bored? Victoria Beckham ("wot wot") apparently had no interest what so ever in the Wimbledon Men's Final between Andy Murray and Roger Federer on Sunday. Husband David Beckham on the other hand seem to be having a great time enjoying the tennis, laughing and smiling throughout the match. Victoria Beckham was clinging to her man like a wet shower curtain during the course of the match and seemed to only be there to promote her own brand of fashion sunglasses and/or clothing. Even when the rain came during the third set and the roof was closed for the rest of the day she kept her oversized sunglasses firmly attached to her face – probably so no-one could see her dozing off through lack-of-interest. 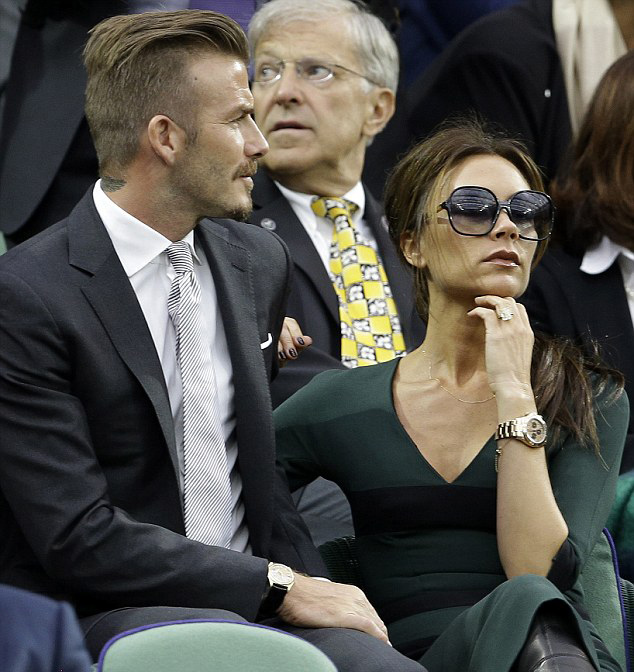 Victoria Beckham was clearly present at the Men's Final for business and PR reasons only. She had apparently loaned Andy Murray's girlfriend – the lovely Kim Sears a £300 pair of her own aviator sunglasses from the VB Collection to model – knowing that television camera's would be watching Kim's reactions throughout the match. 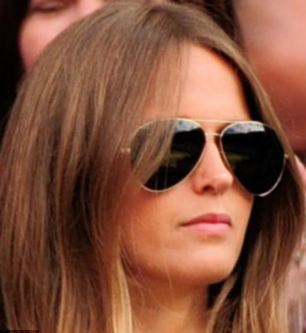 Kim Sears is normally seen wearing Ray-Ban aviator sunglasses while watching Andy Murray play.